Debtor Name: OCZ Technology Group, Inc. The San Jose, CA-based computer component manufacturer's Petition lists approximatey $34 million in assets and $66 million in debts. Click here to purchase the Petition and list of the 30 largest unsecured creditors. Click here to sign up for our Chapter 11 daily list at a discounted rate or contact Ken at ktroubh@nationwideresearch.com to set up a free trial. The Sioux Falls, South Dakota-based media services provider and ten affiliates are represented by Weil, Gotshal & Manges LLP. The Debtors employ approximately 770 employees. The Debtors attribute the filing to a declining room base and revenues, particularly caused by the mobile devices. The Petition lists approximately $292 million in assets and $449 million in debts. DIRECTV is listed as the largest unsecured creditor with an approximate $24.5 million trade claim. According to Debtors' Affidavit, a group of investors let by Col-L Acquisition, LLC (subsidiary of Colony Capital, LLC) will invest a minimum of $60 million in exchange for all the common stock of the reorganized LodgeNet Interactive. According to the Plan of Reorganization, unsecured claims will be paid in full and existing common stock will be cancelled. Debtor Name: Ritz Camera & Image, L.L.C. The Debtor is based in Beltsville, MD and represented by Cole, Schotz, Meisel, Forman & Leonard, P.A. 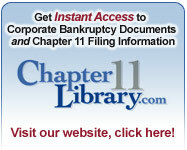 Sign up for our Chapter 11 case notification service now. Email Ken at ktroubh@nationwideresearch.com for details. Debtor Name: NobleHouse Technologies, Inc. The Albany, New York-based hardware/software provider lists $8.3 million in liabilities. Sign up for our new Chapter 11 case notification service now! Daily, weekly and monthly options. We weed out the individual Chapter 11 filings so you can focus on the important business filings. One price for the entire Firm. Mobile-friendly option.